It has been more than a week since renowned Saudi writer Jamal Khashoggi went missing, and none of the concerned parties have presented definitive evidence about his fate, which fuels mystery and rumour. Anyone can be the culprit. Khashoggi was not an opponent of the Saudi regime. For decades he was a journalist and writer who was “close” to the Royal Family in the largest oil exporter in the OPEC group. Later, he became a critic when in 2016 his column was banned from publication in the London-based Al-Hayat newspaper, which is owned by an influential Saudi prince. He went into self-exile in the US in 2017, where he was regularly published in The Washington Post, which protested his disappearance by publishing a blank space where his column is usually published, with the title “A missing voice”. The apparent disappearance of Khashoggi which has mostly been shrouded in mystery, began when he went to the Saudi consulate in Istanbul, Turkey (where he had arrived five days earlier, according to The Guardian), on 2 October to apply for divorce papers so he can marry his Turkish fiancée Hatice Cengiz. According to Guardian reporter Martin Chulov, Khashoggi went to the consulate “after pressure from his fiancée’s father to expedite the marriage process”. Al-Arabiya news channel, which is owned by Saudi investors and which is based in the UAE, quoted members of Khashoggi’s family as saying they do not know “the woman claiming to be his fiancée”. They added that they have more right to talk about Khashoggi than Cengiz and demand to know what happened to him, noting that they are confident in the Saudi government and are coordinating with it. Despite opposing some policies of Saudi Crown Prince Mohamed bin Salman, Khashoggi was not a staunch critic and mostly used an “advisory” tone in his tweets. According to reports by the BBC, The Guardian and others, Khashoggi was reassured by friends he would be safe to go to the consulate. He left the telephone number of a senior Turkish official with his fiancée to call if he did not emerge from the consulate. The BBC reported that Cengiz said she was not permitted to go into the consulate with him, and he was not allowed to take his cell phone with him – which is common practice at many diplomatic missions. He left his phone with his fiancée and asked her to call an adviser to Turkey’s president if he did not leave the embassy. Cengiz said she waited for him to come out for 11 hours, from 1pm local time (10am GMT) until after midnight. She said Khashoggi was “nervous and upset” because he was forced to go. The next day, Cengiz began a sit-in outside the Saudi consulate with several Arab and Turkish journalists. She filed a police report and Turkish authorities began to investigate Khashoggi’s disappearance at a time of lukewarm relations between Riyadh and Ankara, due to Turkey’s support of Qatar during the Gulf crisis when Doha was isolated from most of its neighbours. The media quoted unnamed Turkish officials as saying that Khashoggi is inside the consulate, but one day later Reuters and the BBC reported that Turkish sources said the Saudi writer was “tortured and killed” and “was removed from the consulate”. Meanwhile, other media reports stated that Turkish police will reveal Khashoggi’s location, but these statements were recanted. Saudi Arabia objected to claims he was tortured and killed. He said investigations by the Saudi Foreign Ministry are ongoing to find out Khashoggi’s fate. The BBC reported that Saudi authorities allowed journalists to go into the consulate, and several news channels broadcast a short video of the inside of the consulate. Yasin Aktay, adviser to Turkish President Recep Tayyip Erdogan, said Khashoggi was killed in the consulate and that “15 Saudis” were involved. Aktay, who is also a friend of Khashoggi, did not have evidence to support his claims. He described statements by Saudi officials that there are no cameras inside the building as unrealistic. Cengiz tweeted: “Jamal was not killed; I don’t believe he was killed,” stressing her confidence that Turkish authorities will help her. On Monday, Erdogan said he is personally following the investigations and the results will be announced “no matter what”. He also told reporters that investigators are inspecting security cameras and airports to verify Khashoggi’s movements. “I expect the outcome will be positive,” said Erdogan. The Turkish president was very keen in adhering to a measured tone when pressed on Khashoggi, while allowing government officials and state media to drip-feed allegations. Khashoggi, 60, was a popular guest on Arab and Western news channels, commenting on Gulf and Saudi issues after more than 30 years of experience. After graduating from Indiana University in 1983, he returned to Saudi Arabia and began working at the English-language newspaper Saudi Gazette, as well as Okaz, Al-Sharq Al-Awsat, Al-Majalla and others between 1984-1991 and then became chief editor of Al-Madina newspaper until 1999. Khashoggi was very successful during this period, and travelled to several areas of conflict, including Afghanistan, Kuwait and Sudan, conducting one of the first interviews with the late leader of Al-Qaeda, Osama bin Laden. He then became deputy chief editor of the highly acclaimed English language newspaper Arab News until 2003, when he became chief editor of Al-Watan for a mere 54 days because the minister of information removed him for his criticisms of the religious establishment. He was then appointed as media adviser to then Saudi ambassador to London Turki Al-Faisal until the latter left to become his country’s ambassador to Washington in 2005. 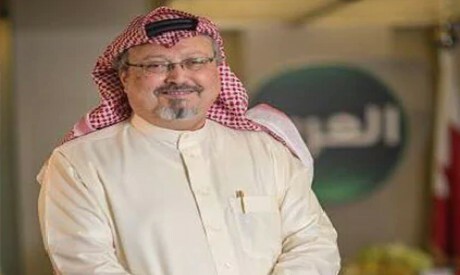 Khashoggi returned as chief editor of Al-Watan between 2007-2010, and resigned “to spend more time on private projects” according to the owners of the newspaper. There were rumours that he was in fact forced to resign. He managed Al-Arab channel, owned by Prince Waleed bin Talal in Bahrain, but that only lasted a few hours. Khashoggi’s complicated journey makes it more difficult to predict his fate. He is intellectually close to the Muslim Brotherhood, but he is in no way a member. He is the product of the Saudi regime, even though he does not tow their line. He has prolific Saudi, Arab and international connections, which could increase his enemies as well as friends, bring publicity to his disappearance. So far, no one has evidence of what really happened.